925 Sterling Silver Rings featuring White cz Round and Square shape women's rings, cubic zirconia fashion rings. Amazing Silver Initial Pendant. 925 Sterling silver with AAA quality cubic zirconia on Rhodium Finished. The rhodium finish will prevent it from tarnishing. 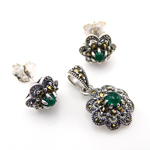 Sparkling marcasite pava setting earrings.Jewelry is crafted of 925 sterling silver. Earrings are studded with shimmering marcasite stones for that classic look. These Square stud earrings are made with round-cut white AAA cubic zirconia stones set in sterling silver. This bangle is made of aluminum. The bangle are designer styled costume .